The New York Times ran an article in their Education section this week, titled “For Asians, School Tests Are Vital Steppingstones.” The piece lauded the Asian American work ethic, and called attention to controversy surrounding prevalence of Asian American students in elite New York public schools. 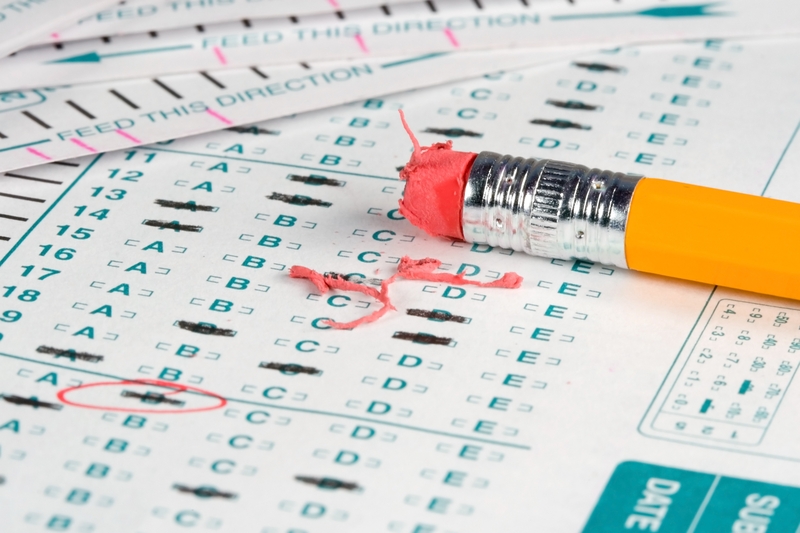 This past September, civil rights groups filed a complaint with the federal government over its policy of using test scores to determine elite school admissions. Testing thresholds, they argued, unfairly favor those who can afford test prep courses. Many of my high school friends (we grew up together in the heart of Bay Area’s Silicon Valley) took to the soapbox. Why, came their collective response, why are Asians being punished for working hard? Some years ago, I would have asked the same question, framed with that exact degree of anger and incredulity. I come from a middle class Taiwanese American family. While we were not obscenely well-to-do, and while I received no tutoring, I nonetheless grew up expecting to overachieve. I am not a terribly disciplined pupil, but I don’t think failure was ever an option. My teens were spent between tissue-thin pages of The Princeton Review’s Something or Other. Probably, my first kiss happened when a boy flashed me…his SAT vocabulary cards. But I’ve since evolved in my understanding of hard work. The New York Times article does us a disservice by looking at one instance of racial marginalization outside the context of institutional oppression. Yes, to the family who clipped coupons till their fingers bled, to the kid who spent her winter breaks nose deep in test prep, this blows. It doesn’t feel fair to work so hard and still not get into the very best public school. How dare these civil rights groups stand in the way of a Horatio Alger fairytale? But there’s a hidden punch-line to every success story. While the buzz words are ‘hard work’, ‘optimism’ and ‘intelligence’, the silent password is Luck. Because these Asian immigrants are also poor, we assume that we’ve controlled for poverty and can accurately isolate the impact of diligence on the social narrative of racial minorities. Except that success in our country is as much a lottery of values as it is of goods. In the last 40 years, research and practice around dismantling institutional poverty (and its clutches on Black, Latino and Native American populations) has centered on parenthood and early childhood education. Exposure to good parenting in a child’s early years can radically alter his narrative. Several prominent nonprofit and advocacy organizations support single, young, poor mothers to become proficient parents. These groups form a network for mothers – helping them apply for better health care, coaching them on child development and nutrition, plugging them in to local social services. Elevating their capacity to support their children through various stages of learning and development. Why do these programs exist, and why are they so essential to these communities? Because that kind of efficacy and know-how doesn’t exist for most victims of institutional poverty. Because institutional poverty isn’t just about being poor. It’s about incarcerated and absentee fathers, teen mothers, mentally ill family members. Histories of drugs and violence. It’s about parents who are not equipped to BE parents, who don’t have the efficacy or know-how or cultural mandate to clip coupons such that their kids can afford tutors. Being poor is just one symptom of their social entrenchment. The true hallmark of poverty is its perpetual cycle. Cultural disempowerment, rinsed and repeated ad nauseam. The article above is talking about a very different class of poor people. They are poor, but not institutionally impoverished. They are not victims of social entrenchment comparable to that which plagues impoverished Black, Latino and Native American communities. Theirs is a much more open narrative, where the insertion of hard work and optimism and intelligence may expectedly be met with moderate if not impressive success. Better yet, I should say that children growing up in these poor families that culturally value education, that fight tooth and nail to secure every academic opportunity – children in these families have the upper hand of efficacy and know-how. They have the upper hand of good parenting. So I can’t engage with the premise of this article. Don’t get me wrong: It is factually a bummer to work hard and be precluded on the basis of one’s hard work. But I can’t take this article seriously because it lives in a vacuum blind to social context. It begins with the assumption that poor Asians play on a level field with poor Latinos, that diligence is some magical ingredient that earns everyone social elevation. I’m not saying they do or don’t deserve to get into the best schools. I refuse to have that discussion, because it’s a discussion happening in a vacuum where all poor people are held equal. How could I possibly decide someone’s desert, someone’s DUE to get into the best school when 1 in 5 children don’t even have access to health care? When 1 in 3 Black men born in 2012 can expect to be incarcerated at some point in their lives? If not getting into Stuyvesant is the grandest imaginable injustice done to Asian Americans, then we need to get out of the house more. Please don’t take this as my suggesting that Asian Americans don’t face daunting challenges. I believe we do, and I believe these challenges are worth discussing. In fact, I’ve commented extensively on them in the past. Issues of representation, emasculation, narrow career options, glass ceilings. Of being targets of violence. These are real, and they deserve attention. But I won’t discuss them in a vacuum. I won’t talk about them in the absence of context, in the absence of awareness. As such, I think Asian Americans (as a social collective) need to operate with greater subtlety in our understanding of social mobility. It isn’t enough to move up, it’s time we moved sideways – into all manners of careers, into more nuanced interaction with other minorities and classes. Into a more balanced perspective on education, which is so much more and so many lessons beyond what we find in a book or on our paycheck. I waited until this last paragraph to mention my rural teaching experience and policy lens. While these are important parts to who I am, I refuse to wear them as a badge of legitimacy. They represent one perspective, and that perspective does not buy me a taller soapbox. All perspectives – even the most relevant ones – are but one part of a (merging, diverging, and often mutually unaware) collective. I hope we push at this and open up the real discussion percolating beneath and beyond the vacuum of Asian American experience. There’s just so much more to it than that. Irene, this is par excellence. You have succeeded at articulating what so many of us know but lack the words or the will to assert over and over again. Further, many familiar with or who hail from from the disenfranchised groups you highlight understand how multifaceted this issue is, but hesitate to advocate in our own best interests. We choose our battles very carefully– our sometimes deflated attempt to preempt the default response that we are copping out by touting helpless victimization. Some of us also suspiciously view commentary like the article cited as the (deliberate or inadvertent) impetus to further divide and alienate previously or currently marginalize groups who stand to learn and gain from working together. Contemporary issues such as the achievement gap would be much better served if more of us would take the time, as you have done, to become more conversant, by examining pressing and enduring social problems within the full context of their causes and effects. Kudos. 32.3% of all Asians in the U.S. live in California, particularly in San Jose, San Francisco, and Los Angeles. Asian Americans are underrepresented in rural and most urban neighborhoods. We cluster in specific urban neighborhoods and suburbs – particularly highly-industrialized cities and wealthy suburban communities. There is a subtle, but huge, difference between a diverse community and a co-mingling neighborhood. Asian Americans typically cluster in neighborhoods that already have a significant Asian population. The real draw of these neighborhoods is not that there are other ethnic groups there, but that there are high numbers of Asian Americans present. That’s not the subtlety of social mobility, of sideways movement that I’m talking about. That’s just more of the same. 23-27% are not religiously affiliated, so your statement is true. But 42% of Asian Americans are Christian, as compared with only 13% Asian Christians in the rest of the world. The latitudinal numbers paint a story of assimilation. Diverse, maybe, but not well-represented across the board. Asian Americans make up 6% of the U.S. population. And 24% of the high-tech industry. They are also well-represented in business/finance/banking, and science industries. What about in politics? In entertainment? In art? Media? Government? Publishing? Sports? Social entrepreneurship? Nonprofit or advocacy? Therein lies the rub. We may have a polite sprinkle of Asian Americans in non-tech, non-business, non-science industries, but that’s all we have: Sprinkles. Diverse, yes. Well-represented? No. Again, we need to rethink our social mobility. We need to move sideways to other industries, not just up and down the ladder in the same industries. Oh, for sure! Asian Americans are either the richest or the poorest population in the U.S., depending on who you ask. While we hold the highest average earnings, we also have the greatest population of poor people (who, again, typically cluster in Chinatowns and other ethnic enclaves). There are libraries of literature on why the employment narrative for Asian Americans focuses predominantly on salary. Not on promotion as leadership, but promotion as increased earnings. Not on working in a particular industry out of love or interest or raw talent, but on the earnings of that industry. Not on education for the sake of intrinsic value, but on education for the sake of obtaining high-paying jobs. Now, I understand. This kind of fixation on money is natural in a capitalist society. But the fixation is more unanimous, more homogenous among Asian Americans than among most other racial groups in our country. All Americans do it, it’s part of our economic DNA. But the path upon which Asian Americans travel to success is narrow, because the reason to succeed is so remarkably singular: Security, in the form of money. Sure, if contribution comes with it. If innovation helps it along. If love happens to align. But those are not reasons to work so much as they are nice bonuses. We need to think outside that box. We need to restructure our social narrative to incorporate a wider range of reasons and manners for mobilizing. I don’t think this is overreaching or random at all. I think it’s uncommon, common sense. Very poignant and well written, in a way that’s not antagonistic, but empathetic and grounded. I should’ve invited you to this event we had yesterday: https://sites.google.com/site/tuftsicp/events/politicalspace. It would’ve been great to engage you in our discussions about structural inequality and efforts to promote interculturalism to “enable people from different cultural backgrounds to mix, exchange and interact for mutual benefit.” I would say that the future looks optimistic though. The potential and even the trend of Asians co-mingling with people of other races and cultures is growing, especially as compared to our parents’ generation or recent immigrants, and the priority of financial security is being challenged, albeit slowly, by our generation and will continually be reassessed in future generations. That doesn’t mean we shouldn’t talk about it now and question the narrative of the current/typical Asian “American Dream” and push beyond it. i initially was introduced to your blog by way of your translation of ang lee’s essay — and as an korean-american stuy alumna, i’ve my thoughts which maybe i’ll elaborate on at a more opportune time. for now, i’ll say that i appreciate your pointing out the vacuum through which anyone will view any given issue. Thanks for your feedback, Sara! I look forward to your elaboration. Pretty nice post. I just stumbled upon yor blog and wanted to ssay thst I’ve really enjoyed browsing yur blog posts. After all I will be subscribing to your feed and I hole you write again very soon!